This fearless female NASCAR driver wants to bring 75 million racing fans over to the green side. Here’s how. Leilani Munter is smoking hot. She’s a NASCAR driver with thousands of fans, regularly collecting fastest-lap and top-finisher results as well as accolades such as “America’s sexiest race car driver” (Men’s Journal) and “Top Ten Female Drivers in the World” (Sports Illustrated). Plus, she’s a dedicated environmentalist. You could be forgiven for doing a double-take. Until recently, motorheads and environmentalists were considered to be clearly marked camps - without much crossover. But all that is changing, with the unstoppable Leilani paving the way. The self-labelled “carbon free girl” uses the powerful world of racing to reach a massive audience – a fan base of nearly 75 million – with important environmental messages. And they’re listening. Off the track she’s just as active, from advocating for clean energy policies to, most recently, starring in the acclaimed documentary Racing Extinction, which got picked up by Discovery for global release later this year. There’s no question, this girl is on a roll. But don’t take our word for it. Read on. Ecozine: You’re both a race car star and an environmental hero. How did that happen? Leilani: My background is really in science. My mother was a nurse, my father a neurologist, and I graduated from the University of California with a degree in Biology. I remember from a very young age trying to get people around me to recycle, and I was always a little bit of an activist for animal rights and taking care of the planet. I started racing in college as sort of as a bucket list item, and ended up being the fastest car on the track. There was a local race team owner that encouraged me to chase racing. So it wasn’t an intentional route, but I quickly realised that being a driver – particularly a female driver in a sport dominated by men – gave me a voice and platform to talk about environmental issues that I really care about, and to a much larger demographic than I ever would have reached as a biologist. Ecozine: How important is this demographic in terms of environmental issues? Leilani: There are 75 million race fans in the United States – that’s almost every third adult! So I’d say they are a population we definitely want to include. If we really want green solutions to be a part of our future, we need to be talking to everybody – and that includes race fans. I do a lot of environmental conferences, I was at the climate march, and as wonderful as it is to be around people who already agree with you and get high fives and pats on the back, at the end of the day, if you want to make a difference you have to talk to the people that are not on board with you yet. It's a more difficult conversation to have, it's more uncomfortable, but that is how we are actually going to change the world! Ecozine: It’s important to make environmental messaging accessible, by reaching out to people in approachable ways that they can relate to. How do you do that with racecar fans? Leilani: I always feel like I am making the most difference when I'm at big races. I drove a car with the slogan ‘energy freedom’ and ‘renewable choices’ on it in front of 100,000 fans at the February 14 ARCA race – which got a lot of TV exposure. We also had a commercial explaining what the ‘energy freedom car’ is about, how we use solar power to ‘fuel’ it, and that we got that idea from the US military, which uses solar in the front lines. Ecozine: So what is the ‘energy freedom car’ all about? 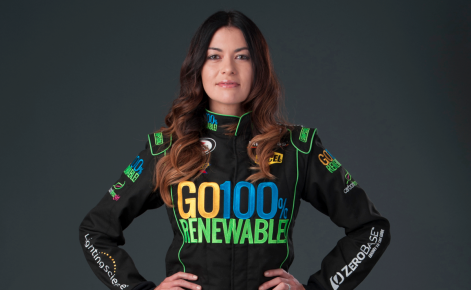 Leilani: The point of the ‘energy freedom car’ is to highlight that clean, renewable energy is something that we should all have the ability to choose. Everyone should have the right to be self-sufficient and produce their own power, or have a say where it is coming from. Our options should include solar, wind and hydropower – rather than, “this is your utility, it’s coal or nuclear, and that is your only choice”. I put solar panels on my roof last year, and they are powering my house and my car. I drive for free every day, thanks to the sunlight that lands on my roof! It really is an amazingly simple thing. Ecozine: How do you see renewables faring in a free and open utility market? Leilani: The utility industry has been a monopoly for so many years, and I believe they’ve dismissed renewable energy and miscalculated the potential demand for it. But the price of solar has dropped by 80% in the last five years, and this increased affordability has encouraged more and more people to use it. Now, across the US, a solar panel goes up in a home or a business every 2.5 minutes. Utility companies are becoming nervous about this, and that is why you are starting to see places where laws exist to make it difficult for people to choose alternatives! But this is bound to change as more people realize what’s available to them – such as free, unlimited power from the sun. Ecozine: It’s not always easy for people to adapt to something they’re not familiar with. How do you get that ‘solar’ conversation flowing? Leilani: I’ve had solar panels for over a year now, and I continually have people asking me: “How much does it cost? How long does it take to make your money back? Where can you buy them?” And I tell them. I welcome those conversations! Where I live, right now you can get solar panels on your roof without paying anything upfront – US$0! That usually gets people’s attention. If it costs the same or less to use renewable energy, why would you choose this incredibly polluted old way of producing power that is putting chemicals in the air? Burning fossil fuels is causing asthma in children and polluting our water. There’s nothing to lose in making the switch to clean energy. It’s a no-brainer once you understand it. Ecozine: Do you think as it gets cheaper people from all segments of society will start choosing renewables over coal, oil and gas? Leilani: Oh yeah, definitely. At the end of the day, all people care. Racecar fans are no different! They have kids, and are worried about their future. They get it. They just need us to embrace them and help them make the transition. At the same time, renewable energies are becoming more of a realistic option economically, and people are being increasingly exposed to the long-term implications of fossil fuels on the planet. People don’t want to get their water from polluted places, or be a slave to oil prices. They are starting to see the true advantages of renewables. I think the dominoes will start to fall very quickly as prices continue to go down. And as the price of solar drops, I think dirtier, dinosaur ways of getting energy through fossil fuels are going to go extinct. Ecozine: What do you think are the most important steps people can take to tackle climate change? Leilani: Everything is tied together. Climate change is tied to our burning of fossil fuels, which is tied to the meat industry, which produces more greenhouse gas emissions than the entire transportation sector combined. Moving towards veganism, and moving towards renewable energy is something that is going to help us ease climate change, conserve wildlife, and ultimately save the planet. Therefore, being able to be one of the early adapters of solar, and also having the chance to plaster it on the side of a racecar and talk about these issues in front of a massive audience, is a huge honour and opportunity. Ecozine: You are known for driving a Tesla off-track. Tell us how the Tesla love affair began? Leilani: Here’s the thing about Tesla. It’s a major bonus that it’s good for the environment – of course! – but that’s not the main driving force behind its success. People want the coolest car on the road, and the coolest car on the road also happens to come with super eco points. Personally, I picked it based on the fact that it is the best driver’s car on the market. It performs, it’s beautiful, it’s fast, it’s silent, and mine runs on sunshine! It cannot get better than that. Ecozine: You played a role in the documentary Racing Extinction, which premiered at Sundance earlier this year and was picked up for a huge global release by Discovery Channel. Can you tell us why you got involved with the film? Leilani: Racing Extinction is about the six mass extinctions that we are currently going through. Scientists estimate that approximately 30,000 species are disappearing each year. We are losing species faster than we can even record them! It’s expected that in the coming years, 40% of amphibians could go extinct, since their skin is permeable and they are very susceptible to pollutants in water or in their surroundings. They are falling away very quickly. There are multiple species that this is happening to, and we don’t even realise. Apart from the tragedy of species going extinct forever, there’s also the risk of what it will mean for all of us, as the planet’s ecosystems start to lose their delicate balance. It’s an issue we need to face, and talk about. I was proud to be part of the film, and I hope lots of people see it. Ecozine: Do your race car fans respond as enthusiastically to these issues as they do your energy freedom cause? Leilani: A while ago, a fan emailed me. He sent me his picture, and he was your stereotypical Nascar fan – a nice big beer belly, Budweiser in hand, and so on. He was writing to me because he couldn't figure out what to get his wife for her birthday, and he had read about my rainforest adoption and decided that he wanted to give his wife an acre in her name. He was writing to find out how to do that. I just know that anyone seeing his picture might have immediately dismissed him and said he's a race fan, so he doesn't care about the planet. But that is just not true. And it’s stories like these that keep me doing what I do. Ecozine: What about veganism? We know you are passionate about that, but surely that must be a hard sell at the racetrack…? Leilani: You would be surprised! I go to Nascar races and talk about vegan food all the time. At a recent race, there was a place right across from the speedway serving vegan fare. I bought vegan chicken wings for all the drivers on my team – a pretty big group of people. The faces of my tech crew showed that they were totally grossed out at the prospect of eating it. But within an hour, all the wings were gone, and the guys were saying they couldn’t believe how good it tasted! So I explained that it’s healthier for you, it’s pure protein, it doesn’t contain all the crap you get when you eat meat, and it doesn’t harm any animals. Ecozine: Do you think the message stuck? Leilani: Three weeks later one of the guys texted me asking the name of the vegan chicken wings since he was going on a camping trip and wanted to get them! Ecozine: Based on your experiences so far, what are your predictions for the future? Leilani: Enough people are starting to get it, and are talking about the changes we need to make to live in harmony with the planet. That is why I think we are going to be okay. This is our moment. I feel that we are living in a generation that is making that shift happen: from oil to electric, coal to solar and wind. We're up against some pretty tough opponents for sure, such as oil and gas, which have a lot of money. But I think in the end, since the facts are on our side and the solutions make sense, green sentiments will spread. This is the greatest challenge of our generation, and I think we’re up to it. I think we’re going to win.